Winter protective styles could be two strand twists, braids, wig, phony pony, or extensions. Putting the hair in a twist, braid, or covered ponytail helps to protect the hair from the harsh temperatures and dry air. Here are some tips to help you keep your hair moist during the fall and winter. Select one or more natural oils to protect the hair. Buy them in preparation for the winter and have them on hand at home. Natural oils help to keep hair strong and resilient. Examples of great oils to put on the scalp and on the ends of the hair are argon, coconut, olive, and jojoba oils. Rinsing the hair with oil after the final rinse in the shower is a great way to apply oil to each strand of the hair. Comb the hair through with a Denman brush before styling. Wearing cornrows, long flat twists, or a simple ponytail will help the hair retain moisture when the ends are placed in a plastic baggy. This baggy can be worn under a phony pony, which is a hair extension pony tail. The small plastic bag helps to keep moisture in and can be worn at home or for a few hours each day secured under a bonnet or scarf. If a wig is worn to protect the hair during the day, wear the baggy a few times a week for a few hours to ensure the ends of the braids, twists, or plats under the wig are moisturized. Make your homemade herbal spritz of your favorite essential oils and thicker fruit oil. Use glycerin or water and place in a spray bottle. There are small bottles that can be placed in a purse or daytime bag. Loose hair that is worn curly in the winter can be spritzed during the day to ensure the hair stays moisturized. 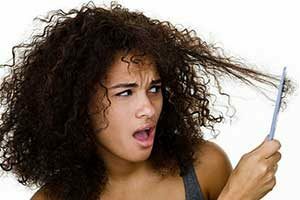 Do you need to improve your natural hair routine [http://www.natural-black-hair.com/naturalblackahair/hairroutine.html]? Or learn about professional afro hair styles? Visit Natural Black Hair [http://www.natural-black-hair.com] Online for More tips.